Has it really been a decade? Ten years? Ten years ago today, I was wearing a black robe, sweating in the hot sun. 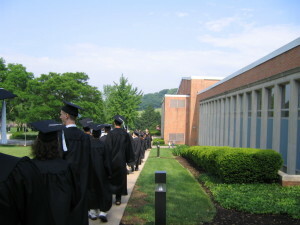 A long line of us, all dressed in black robes, walked along the sidewalk that I had walked on almost every day for the past four years. We sang Under the Sea and other Disney songs as we walked. We marched across the covered bridge, onto the soccer field, and filed into rows of plastic chairs. Soon most of us had our robes open and our top shirt buttons undone to try and escape the heat. Black robes don’t mix well with the somewhat muggy south central Pennsylvania summer weather.